Preliminary Chart of St. Augustine Harbor Florida. 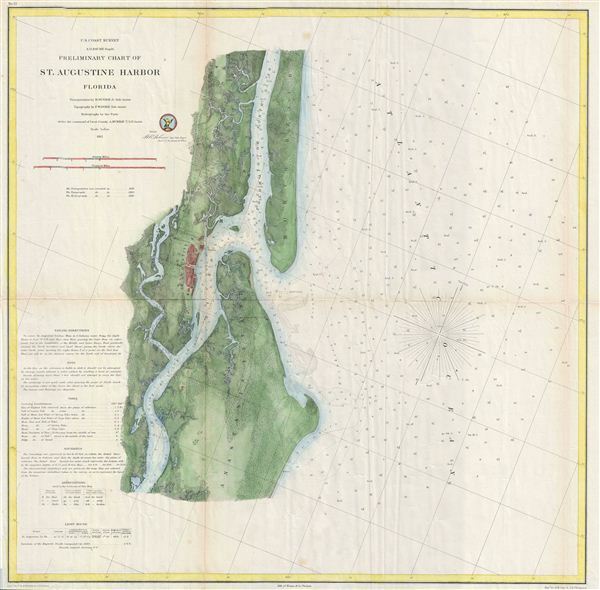 A highly uncommon U.S. Survey nautical chart or maritime map of St. Augustine Harbor, Florida. Centered on the city of St. Augustine (in red), the map covers from North Beach and the Tolomato or North River south to the Matanzas River and Anastasia Island. There are countless depth soundings throughout and excellent inland detail, including basic topography, roads, estuaries, and some individual farms. The St. Augustine Light as well as several shipwrecks are also identified. Founded in 1565 by Spanish explorer and admiral Pedro Menendez de Aviles to counterbalance French incursions into Florida, St. Augustine is the oldest continuously occupied european-established city and port in the continental United States. The triangulation for this chart is the work of B. Huger. The topography was drawn by F. W. Dorr. The hydrography was accomplished by a party under the command of A. Murray. This whole was compiled under the supervision of A. D. Bache, one of the most influential Superintendents in the history of the Coast Survey. Published in the 1862 edition of the Superintendent's Report. Very good. Some toning and wear on original fold lines. Some additional creasing along right center vertical fold. Blank on verso. Library of Congress, Map Division, G3934.S2P55 1862 .U5 CW 120.3.